What do you do when you have a banana surplus? Throw them in your freezer for later, do a double smoothie batch and make banana bread of course. Tyler Florence won my heart with his classic banana bread recipe (and maybe his dapper looks too), but I needed an exciting upgrade. It’s January after all, the month of reinvention and health. 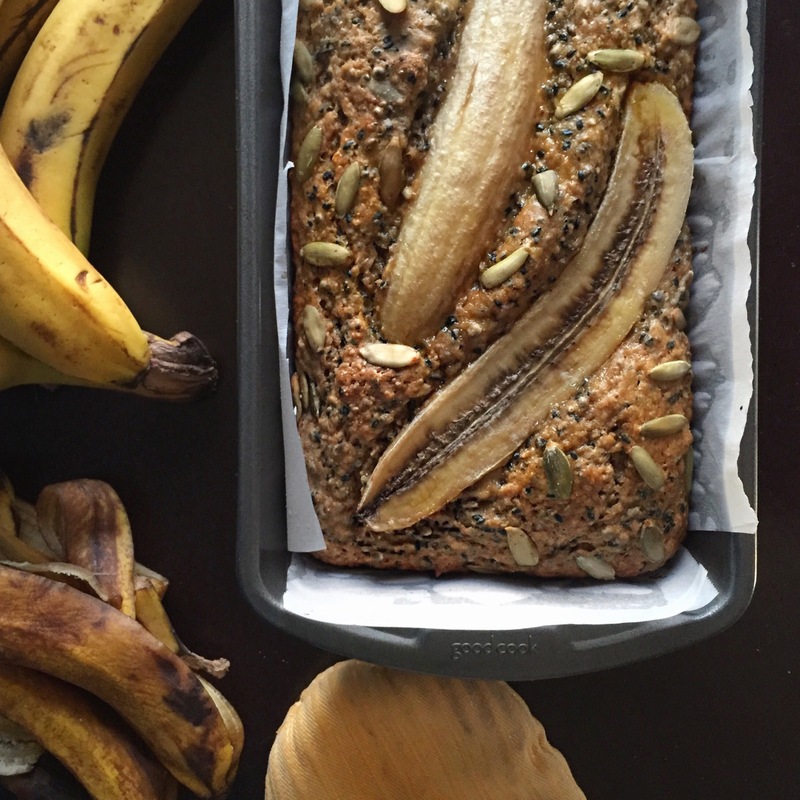 A Google search led me to Anna Jones’ seeded banana bread. I ditched her glaze (which looks amazing) in favor of customizing the sweetness with honeys and jams with each slice. I also improvised on a few measurements since I do not have a scale and some are measured in grams. The banana on top is also pretty darn adorable, if I do say so myself. 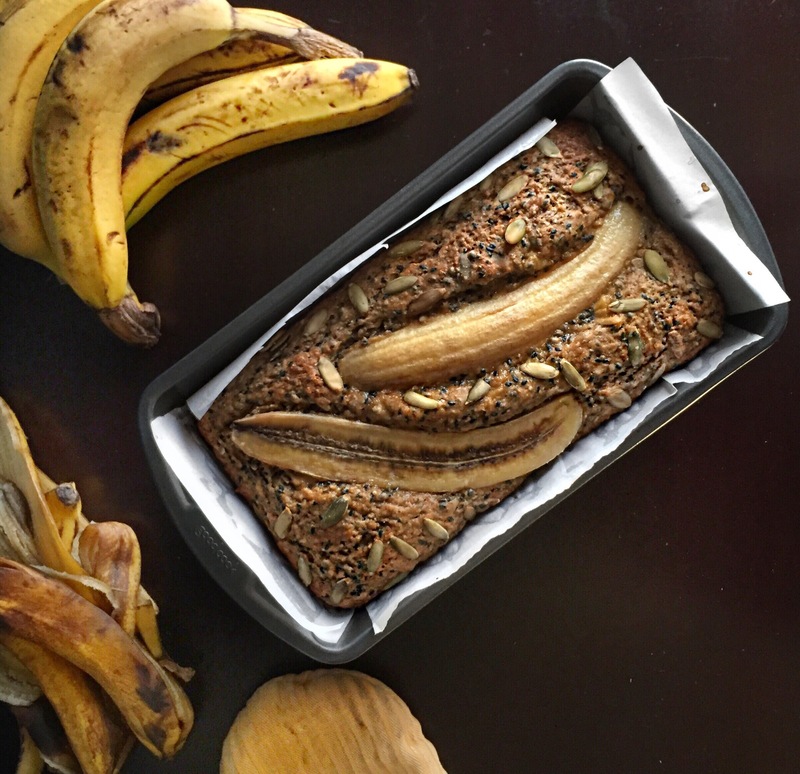 The result is a moist loaf, not crumbly, with an addictive texture, light sweetness and warm banana flavor. 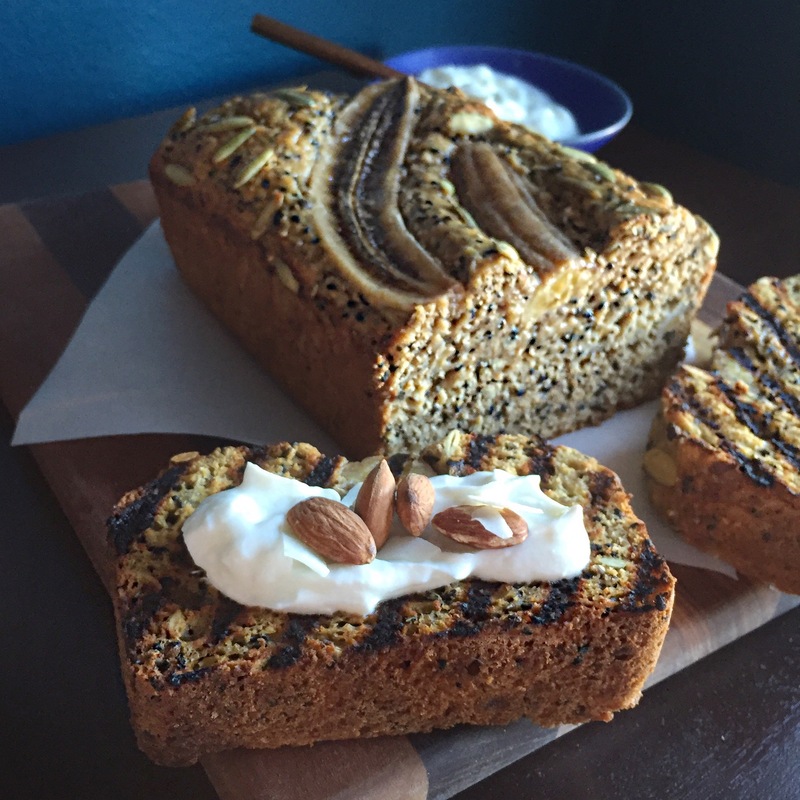 And depending on the seeds you use, this bread is full of omega 3s, iron, protein and magnesium. Happy baking! Preheat your oven to 400° F (375° F for a convection oven). Grease and flour a non-stick loaf tin. If your loaf pan is not non-stick, line it with parchment paper too. Thoroughly combine all the dry ingredients in a large bowl. In another bowl, mash 3 bananas with a fork (I like a little chunk to them), then add the lemon juice and zest, olive oil, yogurt, and eggs and mix well. Mix the wet ingredients into the bowl of dry ingredients, taking care not to over-mix. Pour into the loaf tin. Cut the remaining banana in half lengthwise and place on top of the batter.Gently rub the banana slices with apple cider vinegar, which will help prevent them from turning brown. Bake for 40 to 45 minutes, until a skewer comes out clean. Cool in the pan until you can transfer the loaf to cooling rack. Serve with honey, jam and nut butters. It’s awesome toasted too! Enjoy.